New favorite apple pie? Definitely a new favorite cookbook! All of the pies are made in a 9 x 13 sheet pan! Borrowed from, ‘Pie Squared’, by Cathy Barrow, this made for a very pleasant Saturday afternoon and an amazing family dinner that evening. 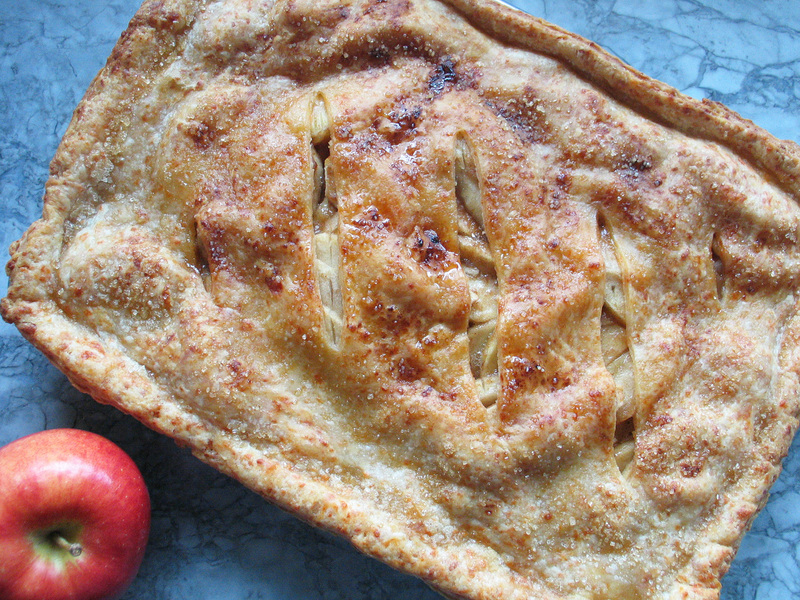 I made the crust the day before, and had some help peeling the apples but changed absolutely nothing in this perfect recipe – enjoy! Using your food processor, pulse the flour, butter, cheese and salt until the butter and cheese are in small pieces – pulse about 15 times. Add the ice water all at once and process until the mixture almost forms a ball. Lay out 2 pieces of plastic wrap on your counter in an ‘X’, and dump the pastry onto the spot where the plastic wrap overlaps. Use the wrap and your hands to quickly smoosh the dough into a fairly even 6 x 4 inch rectangle, handling it as little as possible. Use the plastic wrap to wrap it tightly and refrigerate for at least 4 hours, but preferably overnight. In a large bowl, mix together the sugar, maple syrup, flour, cinnamon and salt, then add in the lemon juice and apples and stir gently until well combined. To make the pie – remove the pastry from the fridge and allow it to warm up for a few minutes, then cut it into 2 pieces, one slightly larger than the other. Roll the larger piece out into an 11 x 15 inch rectangle and then gently press it into your 9 x 13 slab pan, paying special attention to the corners and allowing the excess to drape over the sides. Put this into the fridge. Roll out the second piece of pastry into a 10 x 14 inch rectangle, carefully transfer it to a piece of parchment and then put this pastry into the fridge as well. I prepped both crusts before preparing the filling. Preheat the oven to 425. Scrape the filling evenly into your chilled and pressed bottom crust, then top with bits of butter. Place the top crust over the filling, trim the overhang, crimp the edges and make a few decorative cuts on the top. Brush a bit of water over all, sprinkle evenly with the raw sugar and then bake for 20 minutes at 425. When the timer goes off, reduce the heat to 350, lay a sheet of foil over-top the pie (mine was already a lovely brown), and then bake for an additional 40 to 45 minutes. You decide on the cooking time depending on the appearance of the crust. This pie was amazing – and of course we topped off our large slices with vanilla ice cream.